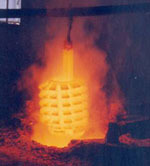 Through decades of experience in producing highest quality tools made from different types of Super HSS, Jainex Aamcol has established guaranteed resources in HSS heat treatment technology. Heat treatment on Super HSS and HSS tools requires special skills and precautions, especially for long shank tools having varying cross-sections. State-of-the-Art heat treating equipments and instruments added with skilled and specialized team assure delivery of uniform and consistent quality of treated tools. Accurate resharpening of tools is of utmost importance for maintaining quality of machined components. Even the best quality tool can be rendered useless due to faulty resharpening. With the long experience and know-how gained during last 25 years of working; tool sharpening using latest technology in the field gives Jainex Aamcol edge over others. Special care is taken to maintain thermal and metallurgical stability of resharpened tools at Jainex Aamcol. Extra care is taken to avoid common tool sharpening problems such as true hob or cutter mounting on arbor, setting up to maintain desired rake faces, flute helix and correct flute indexing, etc. Resharpening of tools on CNC resharpening machines ensures that required degree of accuracy is maintained on the resharpened tools for producing quality machined components. Each resharpened tool is checked on the Klingelnberg P-26 machine. Thus, when hobs, shaving cutters, shaping cutters are sharpened at Jainex Aamcol, the customers are guaranteed of accurate and consistent quality.